Everett was the son of Edgar James McMellen and his 1st wife, Letta B. Rickard. 1912. Everett McMellen was born 4 January 1912 to Edgar J. McMellen and Letta B. Rickard – the only child born to this union. 1914. Everett was just two when his mother Letta filed for divorce from his father Edgar on 31 March 1914. Letta filed from Eaton County, Michigan where her mother was living. 1915. 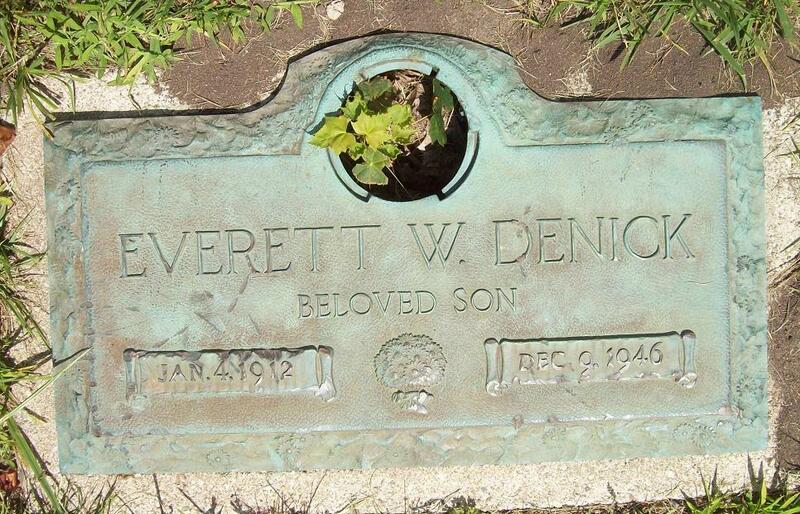 Letta remarried Merle Denick on 15 March 1915 in Charlotte, Eaton, Michigan. Everett was 3. It is unlikely that Everett would remember his father Edgar at such a young age. This is how the Denick name came into that line of the family. “Michigan Marriages, 1822-1995,” database, FamilySearch(https://familysearch.org/ark:/61903/1:1:FCV9-BNH : 10 February 2018), Merle D. Denick and Letta B. Rickerd Mcmullen, 15 Mar 1915; citing reference 2:3WDTPL0; FHL microfilm 966,598. 1920 US Census – Charlotte, Eaton, Michigan. Everett lives with his grandmother Clara Rickerd. He is 7. She, 62 and widowed. They live at 510 Pearl Street. She works as a bean picker in the elevator. “United States Census, 1920,” database with images, FamilySearch(https://familysearch.org/ark:/61903/1:1:MZSP-G4H : accessed 8 August 2018), Everett Denick in household of Clara Rickerd, Charlotte Ward 3, Eaton, Michigan, United States; citing ED 94, sheet 12B, line 77, family 363, NARA microfilm publication T625 (Washington D.C.: National Archives and Records Administration, 1992), roll 763; FHL microfilm 1,820,763. 1930 US Census – Jackson, Jackson, Michigan. “United States Census, 1930,” database with images, FamilySearch(https://familysearch.org/ark:/61903/1:1:XQBH-4PD : accessed 8 August 2018), Everit W Denick in household of Pete M Denick, Jackson, Jackson, Michigan, United States; citing enumeration district (ED) ED 30, sheet 12A, line 31, family 270, NARA microfilm publication T626 (Washington D.C.: National Archives and Records Administration, 2002), roll 996; FHL microfilm 2,340,731. Marriage 1 – Everett McMellen married Beulah Stillwell on 24 May 1930 in LaGrange County, Indiana. 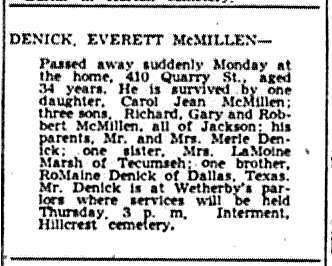 Note that this record lists Everett’s surname as “McMellen” and not “Denick”. It is apparent that though raised a “Denick”, the name was not official. He was not truly adopted. “Indiana Marriages, 1811-2007,” database with images, FamilySearch(https://familysearch.org/ark:/61903/1:1:VKNK-FJX : 10 December 2017), Everett Mcmellen and Beulah M Stilwill, 24 May 1930; citing Lagrange, Indiana, United States, various county clerk offices, Indiana; FHL microfilm 1,871,437. 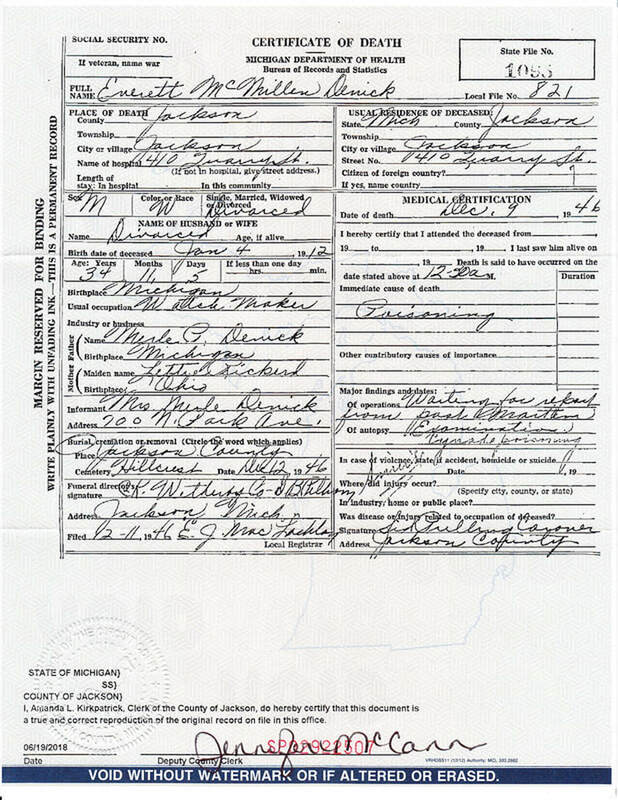 I, Lettie Denick do hereby certify that my Son Everett McMellen was born Jan. 4, 1912, age 18, and I hereby consent to his marriage to Beulah M. Stilwill. Subscribed and sworn to before me this 24 day of May 1930. 1. The full christian and surname of the man is Everett McMellen. 2. Color – White 3. Where born – Grand Rapids, Mich.
12. His occupation – Not known 13. His residence – Grand Rapids Mich.
Everett McMellen deposes and says that he has personal knowledge of the facts above stated and that they and each of them are true. Application for Marriage License – Female. Application is hereby made for a license for the marriage of Beulah M. Stilwill to Everett McMellen upon the following statement of fact relative to said parties. 2. Color – White 3. Where born – Wolverine, Mich. 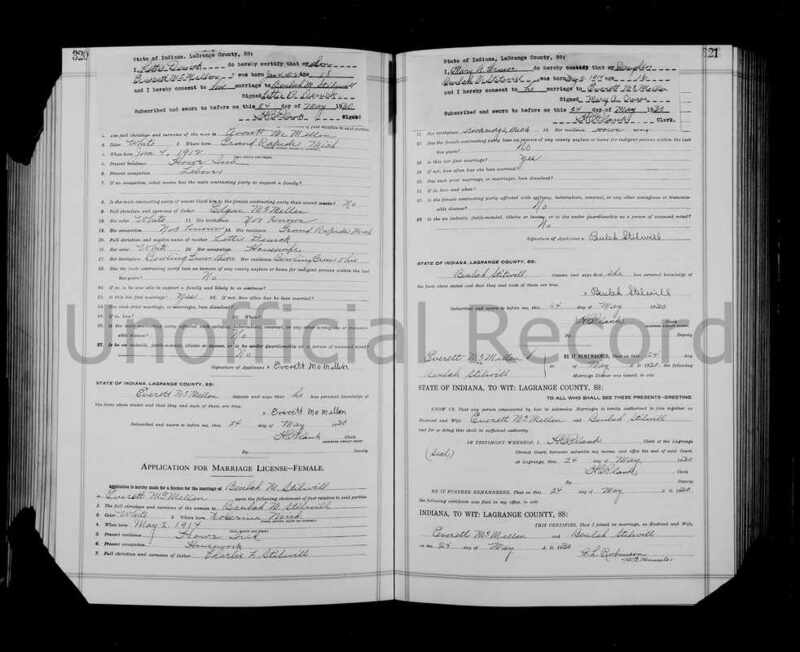 I, Mary A. Crusoe do hereby certify that my Daughter Beulah M. Stilwill, was born May 2, 1914 age 16 and I hereby consent to he(r) marriage to Everett McMellen. Beulah Stilwill deposes and says that she has personal knowledge of the facts above stated and that they and each of them are true. Know Ye, that any person empowered by law to solemnize Marriages is hereby authorized to join together as Husband and Wife, Everett McMellen and Beulah Stilwill and for so doing this shall be sufficient authority. Birth. Daughter Carol Jean McMellen was born 25 December 1930 in Jackson. U.S., Social Security Applications and Claims Index, 1936-2007, database, retrieved 8 August 2018 from Ancestry(http://www.ancestry.com), Carol Jean McMellen. 1930 & 1931 Jackson City Directories – Everett was a machine operator for the Thorres & Maes Manufacturing Company. Lived at 700 N. Park. 1933 Jackson City Directory – Everett worked as a solderer for the Sparks-Withington Company. Lived at 700 N. Park. Wife: Beulah. 1935 Jackson City Directory – Everett works as a factory worker. Lives at 831 Whitney. U.S. City Directories, 1822-1995, database with images, retrieved 8 August 2018 from Ancestry)http://www.ancestry.com), Everett McMellen or Denick. Divorce. Everett was divorced from Beulah between the years of 1933 and 1935. Marriage 2 – Everett McMellen married Blanche Shinn on 11 May 1935. 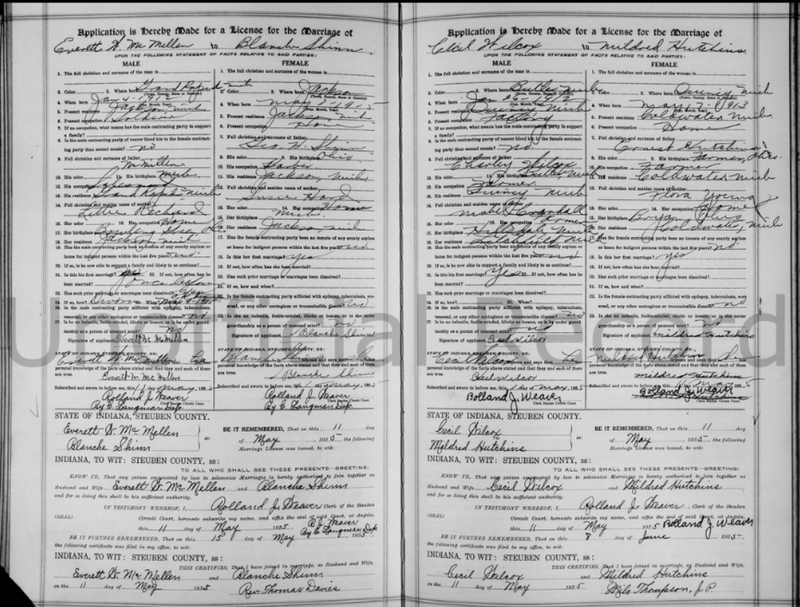 “Indiana Marriages, 1811-2007,” database with images, FamilySearch(https://familysearch.org/ark:/61903/1:1:K3LG-QWD : 10 December 2017), Everett W Mcmillen and Blanche Shinn, 11 May 1935; citing Steuben, Indiana, United States, various county clerk offices, Indiana; FHL microfilm 1,872,331. Sometime after this marriage Everett begins to use the “Denick” surname exclusively. The reason is unknown. All his children to this 2nd marriage bear the “Denick” surname, not McMellen. Birth. Son Richard Denick was born on 1 October 1936 in Jackson. Now lives in the state of Tennessee. Richard had two sons: Scott and Jeff. Birth. Son Gary L. Denick was born on 12 August 1937 in Jackson. US Public records place Gary in Anaheim, California (1972); Corona, California (1990); Kearney, Nebraska (1996); and Yorba Linda, California (1996). 1938 Jackson City Directory – Everett works as a welder for the Acme Industries Inc. He lives at 631 N East Avenue. Wife: Blanche I. 1939 Jackson City Directory – Everett works at same place as 1938. Now lives at 1008 Seymour. 1940 US Census – Jonesville, Hillsdale, Michigan. Everett and his family are marked as guests at the Joe Fischmeister residence in Jonesville, Hillsdale, Michigan. Everett is 28, works as a welder, and 1939 income was $1276. Wife Blanche is 24. Son Richard is 3. Son Gary L. is 2. And son Robert is just 2 months old. “United States Census, 1940,” database with images, FamilySearch(https://familysearch.org/ark:/61903/1:1:K4LW-LMG : accessed 8 August 2018), Everett Denick in household of Joe Fischmeister, Jonesville, Fayette Township, Hillsdale, Michigan, United States; citing enumeration district (ED) 30-9, sheet 10A, line 8, family 237, Sixteenth Census of the United States, 1940, NARA digital publication T627. Records of the Bureau of the Census, 1790 – 2007, RG 29. Washington, D.C.: National Archives and Records Administration, 2012, roll 1755. Birth. Son Robert Denick was born in 1940 at Jackson. 1941 Jackson City Directory – Everett Denick is a laborer and works with his stepfather at Pete’s Radio Shop. Lives at 700 N. Park. 1946 Jackson City Directory – Everett Denick works for his stepfather at the Pete’s Radio Shop as a welder. Lives at 410 Quarry. Wife: Blanche. Divorce 2 – Blanche files for and is granted a divorce from Everett on 16 July 1946. Death. According to the following death certificate, Everett died on 9 December 1946 at 12:50am from cyanide poisoning. Everett was just 34 years, 11 months, and 5 days old at time of death. Under the medical examination section is written “Suicide”. Everett took his own life. He died at his residence: 1410 Quarry Street in Jackson, Michigan. Sons, Richard would have been just 10, Gary 9, and Robert 6. Everett is buried at Hillcrest Memorial Park in Jackson, Michigan. The Jackson Citizen Patriot obit published above refers to Everett’s children as: Carol Jean McMillen, Richard McMillen, Gary McMillen, and Robert McMillen. Were all four born as McMillen’s? The question remains as to the exact date of the name change from McMellen to Denick. It seems post-death of Everett the children, with the exclusion of Carol, take on the Denick surname. Did they live with their grandmother? Was she an influence? Birth certificates from this period are inaccessible so actual birth names can’t be verified.